Robotic missions exploring our solar system have wowed the world with their discoveries and especially the images they return. But even the most sophisticated spacecraft is useless until the science and engineering it gathers makes it back to Earth. NASA’s one of a kind collection of massive dishes around the world makes that possible. Deep Space Network complexes are distributed approximately 120º of longitude around the Earth ensuring spacecraft are visible to at least one at all times. The NASA Deep Space Network (DSN) is an international network of communications complexes supporting interplanetary spacecraft missions and doing a bit of science on its own. The network is made up of huge antennae located at three locations separated by approximately 120º longitude around the Earth ensuring spacecraft are visible to at least one at all times. 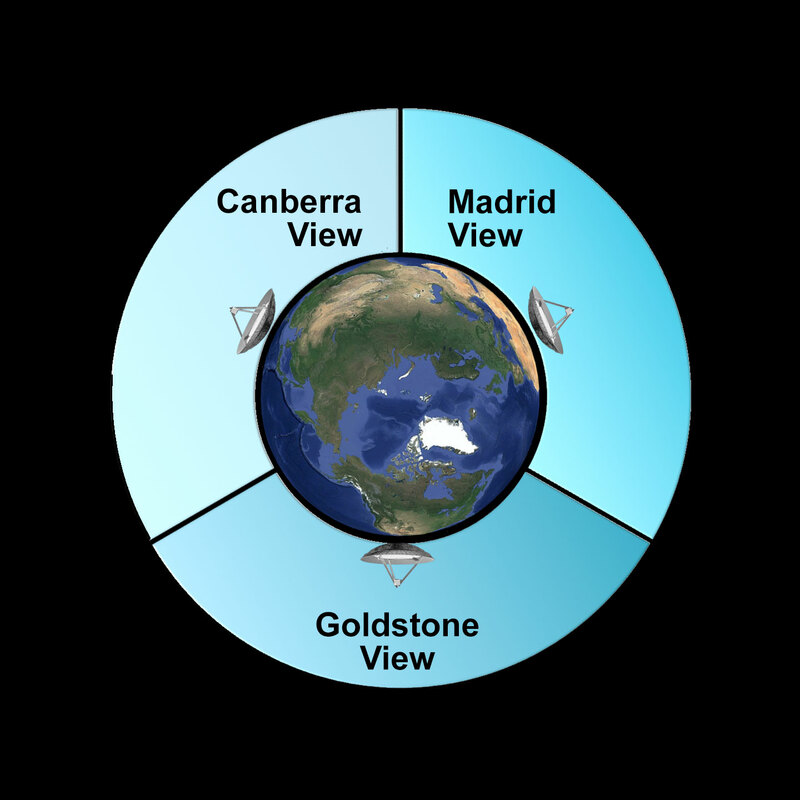 Goldstone located in California’s Mojave Desert halfway between JPL in Pasadena and Las Vegas; at Robledo near Madrid, Spain; and at Tidbinbilla near Canberra, Australia. The complexes stay synchronized within microseconds of each other via atomic clocks. During its first year of operation, the DSN communicated with just three spacecraft. Since then it has played a central role in each of NASA’s high-profile exploration missions, including early Pioneer probes, the Mariner missions of the 1960s and 1970s, Viking and Voyager, Galileo, Cassini- Huygens, as well as each of the Mars rover missions. Today Earth’s only global spacecraft communication network communicates with 30+ spacecraft including those from international partners such as the Japan Aerospace Exploration Agency (Venus Climate Orbiter), European Space Agency (Mars Express), and most recently The Indian Space Research Organisation (Mars Orbiter Mission). These giant dishes do more than act as a cell phone network for distant missions. Some are also active in mapping asteroids via radar as well as radio astronomy. Radar experiments in 1961 helped define the astronomical unit (the average distance between the Earth and Sun), a critical measurement used by astronomers. There is even science in the radio waves themselves. Changes in those waves transmitted back to Earth are helping scientists reveal the interiors of moons and planets and even test Einstein’s theory of relativity. • Tracking: Communication sessions start with an exchange of carrier waves between the antenna on Earth and on the spacecraft. Pure tones which are used to track the position, the lifeblood of engineers responsible for spacecraft navigation. Ranging data helps determine (within 1 meter) the distance to spacecraft. Doppler shift measured on the downlink carrier wave determines velocity within fractions of a millimeter per second. September 3 was like any other day at the DSN. A wide variety of NASA and other spacecraft communicate via multiple antennae at each of the three complexes. • Command: Orders sent to spacecraft. Instructions for new science or course corrections for spacecraft en route. • Very Long Baseline Interferometer: Two or more DSN stations working together to create a giant antenna to observe spacecraft or astronomical objects such as quasars. Here on Earth VLBI can measure continental drift. Each complex is equipped with a 70 m diameter (230 foot) parabolic dish antenna, weighing in at over 2.7 million kilograms (2,970 US tons). Huge antennae are needed to gather the weak signals. Transmitters on each spacecraft produce around 20 watts but the long trip across the solar system reduces that to one billionth of one billionth of a watt. DSN regularly hears from Voyager 2 over 9.7 billion miles from Earth. It takes over 14.5 hours for signals to make it to and from this spacecraft. 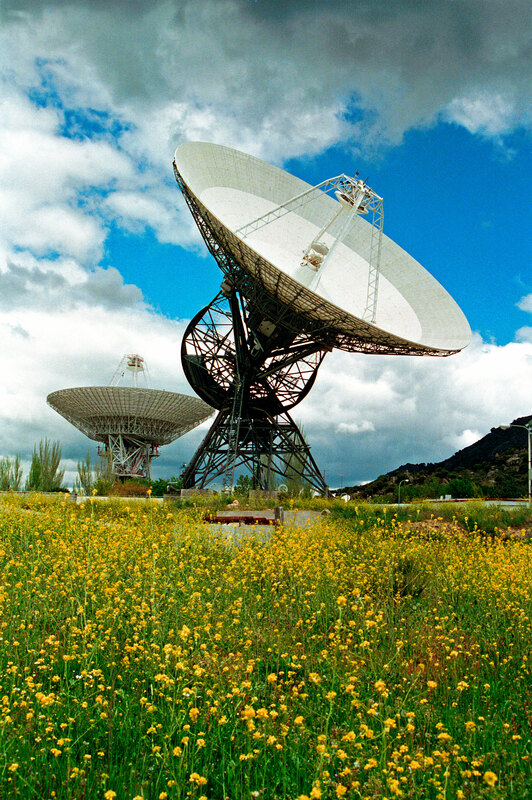 Signals delivered by the dish to ultra-sensitive receiving systems capable of communicating with spacecraft more than 16 billion kilometers (10 billion miles) from Earth. To achieve the precision needed to capture those faint signals each dish is carefully designed and maintained. Each surface is maintained to within a centimeter (0.4 inches). That’s like grooming the surface of a soccer field to vary no more than the height of a single LEGO brick. Goldstone, Madrid and Canberra also have several 34-meter (111-foot) diameter antennas. These use two technologies, a high-efficiency antenna and beam waveguide antenna. Each site also has a 26-meter (85-feet) diameter antenna primarily used today to track spacecraft a bit closer to home, in Earth orbit only 100 and 620 miles (160 and 1,000 km) away. These smaller dishes were built to communicate with Apollo astronauts. DSN dates back to the founding of NASA itself. In 1958, the Jet Propulsion Laboratory positioned portable tracking stations in Nigeria, Singapore and California to track Explorer 1, the first successful U.S. Satellite. The network expanded in 1967 to support Apollo missions with the Honeysuckle Creek Tracking Station near Canberra. The iconic TV images of Neil Armstrong’s “Giant Leap” were received through that antenna before retransmission via Intelsat to a dish to the Jamesburg Earth Station near Monterey, California. 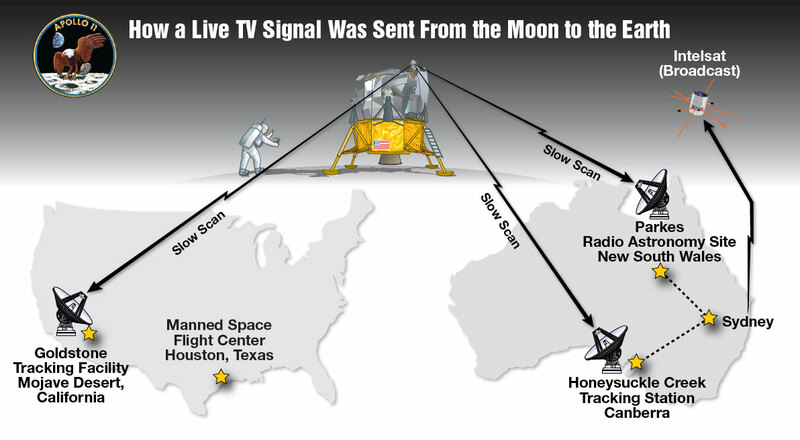 The slow scan format used by the cameras on the moon was converted to a standard broadcast format and again transmitted to Houston and then on to a half billion televisions around the world. Live video from Apollo missions was also received through antennae at Goldstone. The engineers involved were recognized for their technical innovations in 2009 with the Philo T. Farnsworth Primetime Emmy Award. Larger more sensitive antennae were built in the 1970s to support the extending reaches of missions like Pioneer 10 as it imaged Jupiter for the first time. A series of highly efficient 34-meter (112 foot) antennae were constructed in the 1980s bringing communications in the X-band for the first time. With more missions to track and new partnerships with the European Space Agency, the DSN was even busier. DSN’s importance was recognized when the first deep space antenna at Goldstone was named a National Historic Landmark in 1985. The 1990s brought beam wave technology to the network. Signals are routed into a room below ground level with a greater variety of receivers and more security. Today NASA is experimenting with laser communications with the Optical Payload for Lasercomm Science (OPALS), which could enable streaming HD video from Mars. Screenshot of activity displayed at the Deep Space Network Now website. 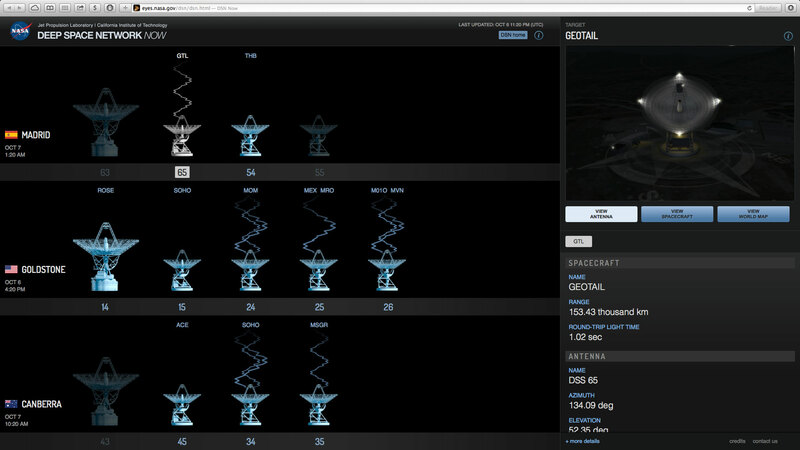 NASA’s Jet Propulsion Laboratory brought mission control to your desktop with Deep Space Network Now (http://eyes.nasa.gov/dsn/). The website brings the status of communications with the spacecraft exploring our solar system. This isn’t a simulation but the same interface on the big screens in NASA/JPL building 230’s Space Flight Operations Facility (a.k.a. JPL Mission Control) with real data updated every 5 seconds. The Goldstone Apple Valley Radio Telescope (GAVRT) allows students to operate a 34 meter (112 foot) radio telescope via the internet from their classroom. They study black holes, planets and help monitor the health of spacecraft throughout the solar system. This is real science and the results go into databases used by astronomers and other scientists around the world. For more information, visit http://www.lewiscenter.org/.